Perhaps the most picturesque area of the Yellowstone region is the Grand Canyon of Yellowstone. The canyon is approximately 10,000 years old, 20 miles long, 1000 ft deep, and 2500 ft wide. 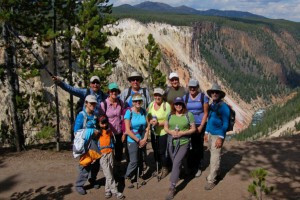 Whether you choose one of our pre-planned trips or want a customized itinerary, there is some much we can show you in Yellowstone. Check out our options and join us today. Experience the breathtakingly beautiful Grand Canyon Rim hike, an amazing trek that shows off the Park's iconic upper and lower falls, mountain meadows and dense forests. The Grand Canyon of the Yellowstone is one of the most amazing natural wonders in the Park. Three walking trails and five overlooks offer great views from both rims. 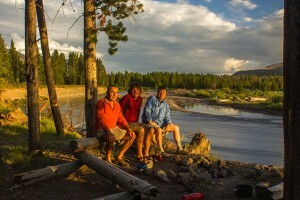 What can I see and do at the Grand Canyon of the Yellowstone River? Cascade Overlook Trail: This trail starts at the well-marked Glacial Boulder and goes about 3/4 mile to Silver Cord Cascade Overlook. Inspiration Point: Enjoy canyon views from the parking area, or walk down 50 steps to the overlook for a better look. The steep climb back up from the overlook is moderately strenuous. From here, the partly paved North Rim Trail leads three miles (4.8 km) to Brink of the Upper Falls. Grandview Point: This overlook is wheelchair accessible with assistance, and a good place to see the river's twisting course below. Lookout Point and Red Rock: Accessed from the parking area, Lookout Point provides the first look at the Lower Falls, while Red Rock Trail is a strenuous walk that takes you close enough to feel the spray. Brink of Lower Falls: Take the trail to the edge and watch the thousands of gallons of water cascade over the falls every second. This is a strenuous hike. Brink of Upper Falls: While shorter than the lower falls, upper falls is equally impressive. The trail here leads to an overlook where the spray often creates afternoon rainbows. South Rim Trail: This partially paved trail runs from the Chittenden Bridge past Artist Point and on into the backcountry. Upper Falls: This is an easy walk to two viewpoints of the Upper Falls. Uncle Tom's Trail: Paved inclines and steps lead 500 feet down to a viewing platform for an intimate look at the Lower Falls. This walk is steep, and strenuous. Historical Tidbit: Uncle Tom Richardson used to lead visitors on guided trips into the canyon (along his trail). He used a series of rope ladders to access the bottom. In 1903 the Chittenden Bridge was completed and Uncle Tom lost his permit. Artist Point: The often-photographed view of the waterfall cascading into the canyon makes it easy to understand this observation point's name. How can I get to the bottom of the Grand Canyon of the Yellowstone? The Seven Mile Hole Trail accesses the bottom of the canyon. This strenuous 11 mile hike begins at the north end of the North Rim. 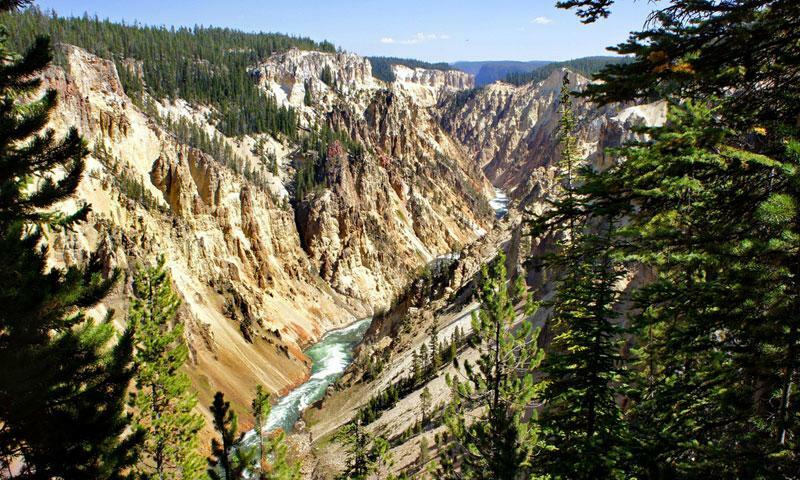 Where is the Grand Canyon of the Yellowstone? 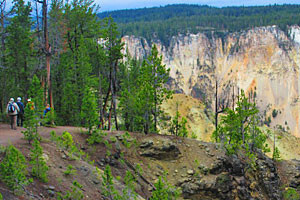 The Grand Canyon of the Yellowstone is easily accessible from the Canyon Village area in Yellowstone. From Canyon Village drive south on the Loop Road. Two roads access the Grand Canyon. The first left is the North Rim Drive and is a one-way road that loops back to Canyon Village. The second left is the South Rim Drive, an out and back road that accesses Artist Point. When can I visit the Grand Canyon? The Grand Canyon of the Yellowstone is only accessible to vehicles during the spring, summer and fall. During the winter months, snowcoach tours offer day trips to this area of the park. Great hiking route into the heart of the Teton mountains. Great, scenic side-route when visiting the Salt Lake area.